Boxes, boxes and more boxes. I like boxes. Boxes can be useful. They can hold ordinary stuff or they have the potential for keeping magical and special items safe. The outside of a box can be plain or it can be a work of art. An especially beautiful box could be hung on the wall. I’ve always been fascinated with the idea of transferring images from one thing to another. This summer, I experimented with a way to print images onto a special transfer paper. The resulting print can be permanently transferred onto almost any object. Including boxes. I went on the hunt for boxes. I bought a bunch. I played around with a lot of ideas. 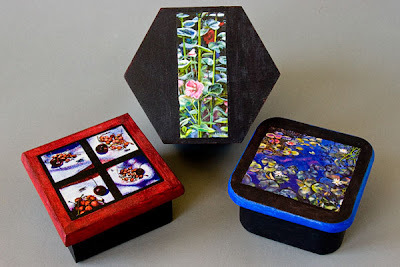 What you see here are a series of boxes with transfer images (vastly shrunk in size) of some of my paintings. The top edges and sides of the boxes are painted to complement the colors in the paintings. This was exciting! I lined the inside bottom of each box with felt. They can hold things. They can be hung on the wall. They make great gifts, they can hold great gifts.